In a study published today in Astrophysical Journal Letters, lead author Dawn Erb of the University of Wisconsin-Milwaukee and her team – for the very first time – used new capabilities at W. M. Keck Observatory on Maunakea, Hawaii to examine Q2343-BX418, a small, young galaxy located about 10 billion light years away from Earth. BX418 is also attracting astronomers' attention because its gas halo is giving off a special type of light. "In the last several years, we've learned that the gaseous halos surrounding galaxies glow with a particular ultraviolet wavelength called Lyman alpha emission. 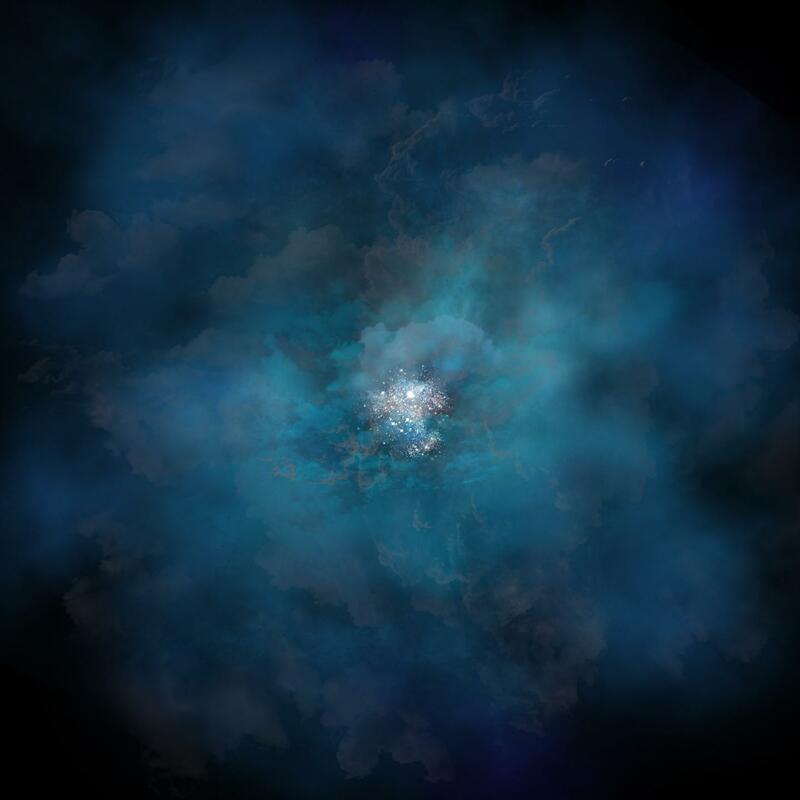 There are a lot of different theories about what produces this Lyman alpha emission in the halos of galaxies, but at least some of it is probably due to light that is originally produced by star formation in the galaxy being absorbed and re-emitted by gas in the halo," said Erb. Erb's team, which includes Charles Steidel and Yuguang Chen of Caltech, used one of the observatory's newest instruments, the Keck Cosmic Web Imager (KCWI), to perform a detailed spectral analysis of BX418's gas halo; its properties could offer clues about the stars forming within the galaxy. "Most of the ordinary matter in the universe isn't in the form of a star or a planet, but gas. And most of that gas exists not in galaxies, but around and between them," said Erb. "The inflow of new gas accreting into a galaxy provides fuel for new star formation, while outflows of gas limit a galaxy's ability to form stars by removing gas," says Erb. "So, understanding the complex interactions happening in this gaseous halo is key to finding out how galaxies form stars and evolve." This study is part of a large ongoing survey that Steidel has been leading for many years. Previously, Steidel's team studied BX418 using other instruments at Keck Observatory. "Our study was really enabled by the design and sensitivity of this new instrument. It's not just an ordinary spectrograph–it's an integral field spectrograph, which means that it's a sort of combination camera and spectrograph, where you get a spectrum of every pixel in the image," said Erb. The power of KCWI, combined with the Keck telescopes' location on Maunakea where viewing conditions are among the most pristine on Earth, provides some of the most detailed glimpses of the cosmos. Erb's team used KCWI to take spectra of the Lyman alpha emission of BX418's halo. This allowed them to trace the gas, plot its velocity and spatial extent, then create a 3-D map showing the structure of the gas and its behavior. The team's data suggests that the galaxy is surrounded by a roughly spherical outflow of gas and that there are significant variations in the density and velocity range of this gas. "As we work to complete more detailed modeling, we will be able to test how the properties of Lyman alpha emission in the gas halo are related to the properties of the galaxies themselves, which will then tell us something about how the star formation in the galaxy influences the gas in the halo," Erb said. Erb is supported by the US National Science Foundation through the Faculty Early Career Development Program, grant AST-125591. Steidel and Chen acknowledge support from the Caltech/JPL President's and Director's Fund. The W. M. Keck Observatory telescopes are among the most scientifically productive on Earth. The two, 10-meter optical/infrared telescopes on the summit of Maunakea on the Island of Hawaii feature a suite of advanced instruments including imagers, multi-object spectrographs, high-resolution spectrographs, integral-field spectrometers, and world-leading laser guide star adaptive optics systems. The data presented herein were obtained at Keck Observatory, which is a private 501(c) 3 non-profit organization operated as a scientific partnership among the California Institute of Technology, the University of California, and the National Aeronautics and Space Administration. The Observatory was made possible by the generous financial support of the W. M. Keck Foundation. The authors recognize and acknowledge the very significant cultural role and reverence that the summit of Maunakea has always had within the Native Hawaiian community. We are most fortunate to have the opportunity to conduct observations from this mountain. For more information, visit http://www.keckobservatory.org.